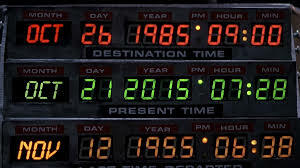 The pop culture was all abuzz with Back to the Future references this past week because October 21, 2015 was the fateful day in the “future” to which characters Marty McFly and Doc Brown (no relation, though my daughters tell me there is some resemblance when I am stressed) in the second Back to the Future film. It certainly had Chicago Cubs fans all geeked since the film teased a Cubs World Series win in 2015 which seemed plausible until just a few days ago. So much for that. Even the insurance press got into the spirit of the week. Insurance Journal published this fascinating comparison of today’s insurance industry with that of the mid-1980s from whence Marty McFly traveled. I found this especially entertaining since the mid-1980s was when I began my career as a Michigan State graduate (more on that in a moment) who had just accepted my first full-time employment gig as a commercial underwriting trainee with CIGNA Property & Casualty Insurance Company. I remember the ISO changes and the “new” Commercial General Liability policy forms, thankful that I didn’t have the “baggage” of knowing a whit about the forms they were replacing. On the other side, there is this Insurance Journal glimpse 25 years into the future of auto insurance. As difficult as it is for an “old-timer” to imagine an auto insurance market 60% smaller than today’s market, the logic is sound and plausible. But have no fear young insurance professionals, and students preparing to join the industry. There are and will continue to be growth opportunities for the insurance market as long as innovation and economic growth persists. Two words: Cyber Risk. Oh yeah, about the young underwriter and graduate of Michigan State University… please indulge me as I share this religious experience from last weekend. Go Spartans! This entry was posted in Insurance and tagged change, future, insurance, Michigan State, Spartans on October 24, 2015 by drdavidallenbrown. The following morning we listened to breakfast keynote speaker J. Patrick Gallagher, Chairman, CEO, and President of Arthur J. Gallagher and Company. He marveled at the amazing business that is insurance, and encouraged the students to spread the word about the fantastic career opportunities in this field. Mr. Gallagher noted that the industry could absorb the entire Gamma Iota Sigma membership of over 2,000 students and still have abounding opportunities. Friday afternoon was filled with educational sessions and a robust career fair that gave students a multitude of interview opportunities, for both internships and permanent jobs. Friday evening culminated with an awards banquet at Navy Pier. Saturday began with the whimsical and always entertaining chapter roll call skits. 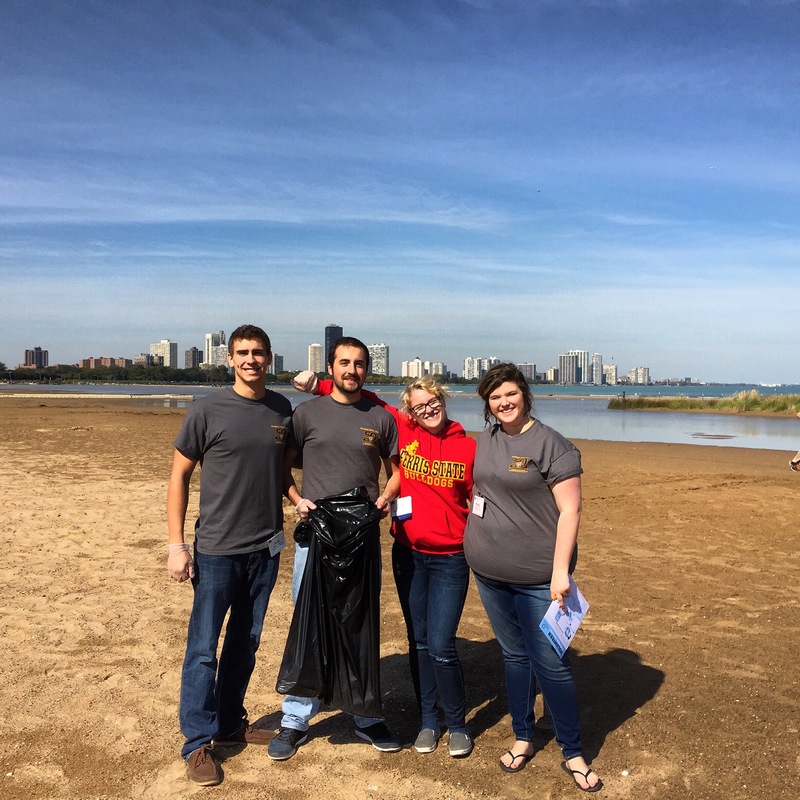 The students then embarked on a variety of community service activities, one of which took some of our Ferris State representatives (Jared, Alex, Kate, and Morgan) to clean up Montrose Beach as pictured below. Saturday evening, the conference concluded with a closing dinner and dance party. We all made the journey home on Sunday, filled with enthusiasm, ideas, and hope for the future. Personally, this was my first Gamma Iota Sigma conference and I was incredibly proud of our Ferris State students and the growth of the Upsilon chapter. 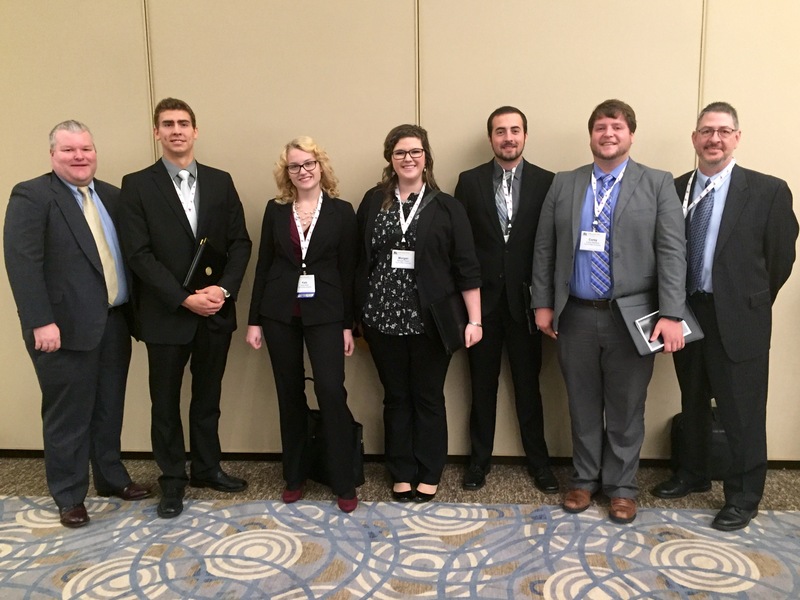 I hope that many more of our risk management, insurance, finance, and actuarial science students will get involved with the chapter and have the opportunity to attend future conferences. This entry was posted in careers, Conference, Insurance, Risk Management, Uncategorized and tagged actuarial science, Chicago, Gamma Iota Sigma, insurance, international conference, risk management on October 17, 2015 by drdavidallenbrown. Alright, this is just plain fun. The Icon A5 personal aircraft is making its debut. I’ve been watching the development of this aircraft from afar for a few years now. I’ve always had an interest in aviation, but I have never taken the time to become a licensed pilot. The Icon A5 can be piloted with a Sport Pilot License, though my wife has been reluctant to grant her blessing for any adventure that takes me higher off the ground than a step ladder. I have pointed out the safety parachute feature of the Icon A5, but she remains unconvinced. How does this relate to risk management and insurance? Well, it certainly has implications for the currently rather small market for personal aircraft insurance. Moreover, those personal umbrella policies are going to get a bit more expensive for Icon A5 owners. If the Icon A5 becomes the next expensive toy that enthusiasts purchase in place of (or along side of) speed boats and sports cars, there could be thousands of these babies in garages across the nation. This entry was posted in Insurance and tagged icon a5, insurance, light sport aircraft, personal aircraft on October 8, 2015 by drdavidallenbrown. How’s your personal liability coverage? Does it cover claims alleging libel, slander, or defamation? Commercial liability insurance carried by business concerns generally have some coverage for such claims, but it’s a mixed bag for personal insurance policies such as your homeowner’s (or renter’s) and automobile liability. More often than not, individuals have little or no insurance coverage against such claims. Then again, why should I worry whether my personal insurance covers me against such claims? I’m just an average guy, college professor, living a comfortable but unremarkable middle class life. Who could possibly sue little ol’ me for libel, slander, or defamation? Let me count the loss exposures… I blog. I use Facebook. I post reviews on Yelp. Uh oh. Did my negative review of the poor service and terrible food at that restaurant last week cause them to lose business? Are the restaurant owners indignant and angry and talking to their lawyers? Here it comes. If you think I’m being silly, there are already commercial firms taking steps to chill the free speech, wild west of online review sites such as Yelp. These firms are including language in their online terms and conditions (which we all read, right?) such as “…[you] may be held legally liable for generating any potential negative, verbal, or written defamation…” Thankfully, there has been some blow-back on such tactics but it’s easy to see where this is going. Now there is an even more chilling new front opening up on this battle between free speech and privacy rights. A new app (supposedly launching next month) called Peeple is billing itself as “Yelp for people” with its mission being the rating and reviews of individual people, by other people. Oh, I’m sure nothing can possibly go sideways with this idea. This new app will allow everyone that you encounter to rate you. This just might be the worst idea of 2015, if not the decade. I don’t even know where to begin… Do you remember the old-fashioned typewriters where each letter was mechanically connected to an individual key on the keyboard, and if you pressed several keys down at the same time all the letters would simultaneously rise toward the strikepoint and become a stuck, jumbled mess of mechanical arms? That’s how my brain is reacting to the Peeple app idea. Too many thoughts, too little time to express them all. Besides, I’m not sure that I want to enumerate my concerns over this slander factory in waiting. After all, I’ve probably already said too much and will be hearing from Peeple’s legal team any moment now. So I ask again, how’s your personal liability coverage? I’m going to go read my policies again. In the meantime, I think it best that I suspend my Facebook, Yelp, blogging,… ah, what the heck. Maybe it’s time to go off grid entirely for a while. Be warned, if you post a negative comment regarding my blog post, you could be sued. This entry was posted in Insurance and tagged defamation, insurance, libel, personal liability, slander on October 2, 2015 by drdavidallenbrown.